With quality being lost in imported products and good quality truck hardware getting harder to find our Australian made taillight assembly units meet the desires of the Australian truck and transport industry for both on and off road vehicles. 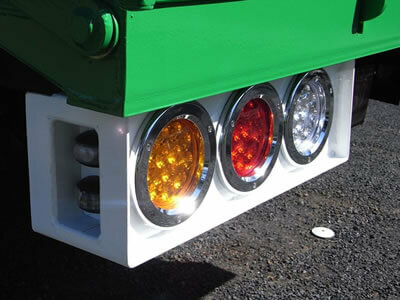 We offer quality built tail light assemblies for truck bodies, trailers, heavy vehicles, machinery and equipment. Our tail light assemblies are built within a strong steel housing offering extra strength and protection for your tail lights within all heavy vehicle industries. Our range of tail light assemblies are perfect for heavy vehicles, truck bodies, semi trailers, trailers, mining equipment and earth moving machinery such as bull dozers, diggers, rollers and loaders. A strong steel frame to withstand the daily duties and environment of work sites, mining sites and quarries saves time and money in continuous tail light damage frequently seen with plastic blinkers, tail and brake lights. The tail light assemblies shown below showcase an example of a strong steel protective tail light housing with quality led tail lights fitted onto a truck body. We not only build and sell tail light assemblies but also fit and complete all auto electrical work. Custom built tail light housings are also available.